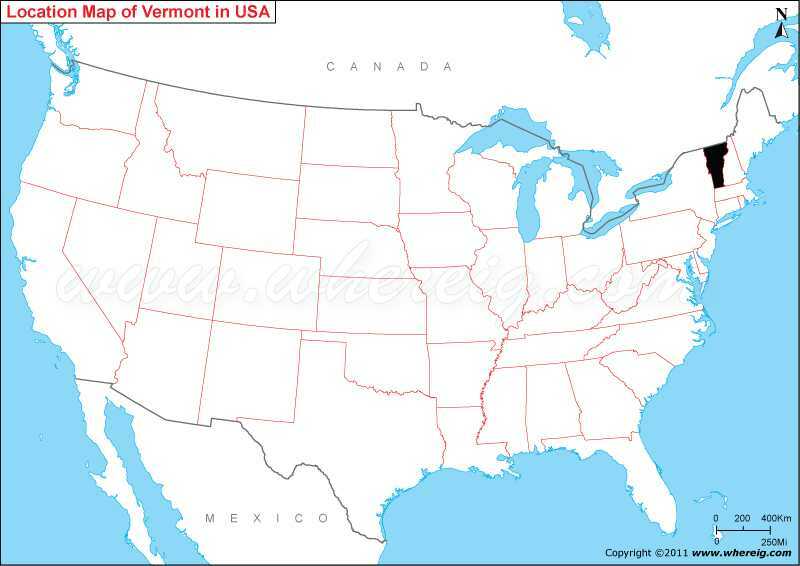 Where is Vermont located on the US map? As shown in the given Vermont location map that Vermont is located in the north-east part of the United States. The state is the part of New England region. Vermont map also illustrates that it shares its border with New Hampshire in the east, Massachusetts in the south, and New York in the west. Besides, it also shares international border with Canada in the north. Furthermore, it is the only state in the New England region that does not borders the Atlantic Ocean. The capital city of Vermont is Montpelier; however, the most populous city and metropolitan area is Burlington. Geographically, Lake Champlain forms about half of Vermont's western border; the Green Mountains lies in the state. The north-eastern state Vermont is one of the leading producers of maple syrup in the country. The climate type of Vermont is humid continental. The tourism in the state is also a significant economic activity that generates substantial earnings for the state. The winter fascination activities in the state for the tourists are skiing especially in the Burke Mountain Ski Area, Bolton Valley, Stowe, Smugglers' Notch, Killington Ski Resort etc.